Established in 1957 as a refugee camp, the Yarmouk district of south Damascus is considered the capital of Syria’s Palestinian population. Before December 2012, it was home to around 400,000 people, most of them the descendants of Palestinians who were forced to leave Palestine or had fled during the Arab-Israeli War of 1948. For almost five decades, Yarmouk has been a hub of political activity for the Palestinian diaspora. When the Baath Party came to power in Syria in 1963, it overtly supported the Palestinian liberation movements, including Fatah and the more radical Popular Front and Democratic Front, allowing them to establish their headquarters in Yarmouk. Fatah dominated the political scene in the district until the mid-1980s. However, the party was banned in Syria in 1985, as relations between then Syrian President Hafez al-Assad and Fatah’s Yasser Arafat deteriorated. It was replaced by Palestinian movements allied with Damascus including the breakaway Fatah al-Intifada, the Popular Front for the Liberation of Palestine – General Command (PFLP-GC) and the Islamist Hamas and Islamic Jihad (the last two moved their headquarters to Damascus in 1999). The anti-Assad revolution that erupted in early 2011, divided opinions among the residents of Yarmouk, says Mustafa Khalaf, a local media activist. While some expressed support for the Syrian regime, citing the government’s decade-long protection of Palestinians, others aligned themselves with the revolution, denouncing the regime’s brutal treatment of protesters. Still others tried to remain neutral, syas Khalaf, arguing that they were “guests” in Syria, regardless of how long they had lived there. Yarmouk’s first reported anti-Assad protests took place in early 2012 and were brutally suppressed by regime forces, says Khalaf. The regime also armed the PFLP-GC, allowing it to disperse protests and resist attempts by the opposition to capture the district. By mid-2012, however, the neighbourhoods in Yarmouk’s south, east and west had fallen into the hands of the opposition and the al-Qaeda-aligned Jabhat al-Nusra. Hajar al-Aswad, Yalda, Daf Ashok and al-Qadam had all become rebel strongholds. “Yarmouk had been a safe haven for families fleeing the nearby rebel-controlled towns, which were being heavily shelled by the regime,” says Hasan al-Nader, 65, who lived in Yarmouk at the time and hosted a displaced family for a month. In January of that year, Hamas had announced it was moving its longtime base from Damascus to Doha, Qatar, leaving only grassroots support in Yarmouk. The following month, Hamas leaders openly criticized the Syrian regime’s handling of the protests and expressed support for the Syrian people’s revolution. Media reports indicate that Yarmouk was drawn into the Syrian conflict in December 2012, when clashes broke out between rebels and the Army-backed PFLP-GC fighters. It was also reported that many fighters defected from the PFLP-GC and joined the rebels. Dozens of small, anti-Assad groups were formed, says Khalaf, including Aknaf Bait al-Maqdis, a faction loyal to Hamas. By mid-December 2012, the opposition had gained control of most of Yarmouk. Jabhat al-Nusra, Aknaf Bait al-Maqdis, Ahrar al-Sham and Ababil Horan were the main forces that entered the district. Large numbers of civilians fled following the withdrawal of PFLP-GC fighters. According to sources at the United Nations Relief and Works Agency for Palestine Refugees in the Near East, only 20,000 civilians were left in Yarmouk by April 2015. As soon as Yarmouk fell, the regime mobilized its forces along with its Palestinian allies (PFLP-GC and Fatah al-Intifada) at the district’s northern entrance, in an effort to stop the opposition’s march towards the heart of Damascus. In July 2013, these forces laid siege to Yarmouk, effectively sealing off the northern entrance. 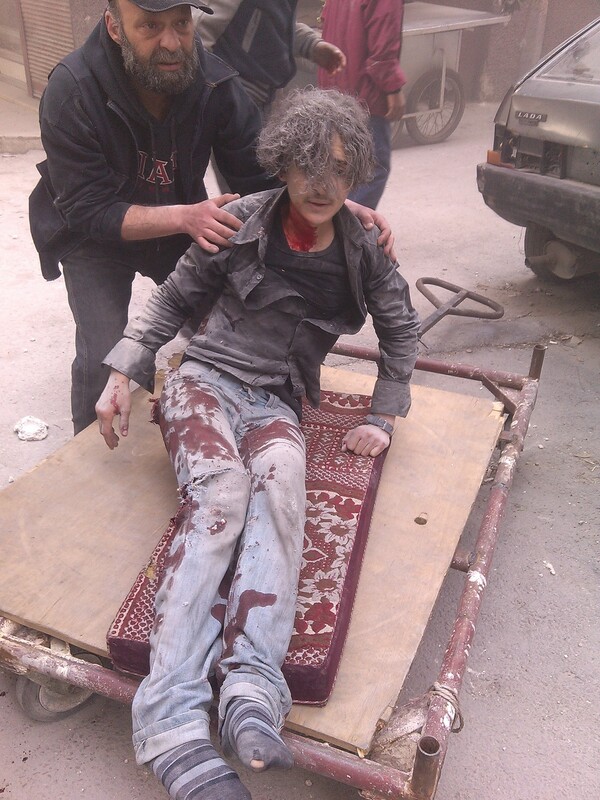 The siege aggravated the already dire conditions inside Yarmouk. By April 2015, insufficient food and medical supplies had claimed the lives of around 200 people, according to the Action Group for Palestinians in Syria. The limited food available was smuggled in through Yarmouk’s southern entrance and sold at vastly inflated prices, says Khalaf. In a report published on 18 February 2015, the Vienna-based Friends of Humanity organization estimated that 2,651 Palestinians had been killed in Syria since the beginning of the conflict, most of them by regime forces. It added that 818 Palestinians had been arrested, 293 of whom had later been killed in prison. “The Syrian authorities took an inhumane measure against the civilians of Yarmouk when they cut off the electricity supply to the area on 18 April 2013, and then cut off the drinking water on 8 September 2014,” the organization said. “During winter, the civilians of Yarmouk struggle to get heating fuel.” The report also highlighted the regime’s continuous shelling of Yarmouk, which targeted hospitals, schools and mosques. As the humanitarian situation in Yarmouk worsened, a number of independent figures tried to broker a reconciliation between the regime and the besieged armed forces. According to details leaked on social media, the agreement was supposed to neutralize Yarmouk in the Syrian conflict and end the siege. However, these attempts failed, allegedly due to the objection of certain armed groups in the southern countryside, especially Jabhat al-Nusra and Islamic State (IS), which controlled the adjacent neighbourhood of Hajar al-Aswad. On 1 April 2015, IS made headlines when it launched an attack on Yarmouk with the aid of Jabhat al-Nusra. It took their fighters only three days to capture more than 70% of the district and corner Aknaf Bait al-Maqdis and other opposition groups in a few blocks close to the frontlines with the regime forces. News from inside Yarmouk indicated that a number of groups had promised allegiance to IS, after the latter began beheading captives. According to sources from Yarmouk, the attack came a few days after Aknaf Bait al-Maqdis arrested two IS fighters over suspicions that they had assassinated Yahia Horani, a former Hamas leader. Others in Yarmouk say that IS invaded to block the reconciliation agreement Aknaf Bait al-Maqdis and other groups were about to reach with the regime. According to the same sources, 1,500 fighters, including 200 from Jabhat al-Nusra, were in Yarmouk at the time of the attack. In the meantime, activists were quoted in the press as saying that the regime had intensified its airstrikes and shelling of Yarmouk, killing dozens of civilians and destroying buildings, while its ground forces and their allies attempted to advance into the district. These moves had seemingly put Aknaf Bait al-Maqdis in an untenable position, forcing it to rethink its options and allegiance. Following IS’s invasion of Yarmouk, al-Hayat newspaper reported that Hamas leaders had communicated with pro-Assad Palestinian factions, including PFLP-GC, to discuss joining forces against IS and Jabhat al-Nusra. The report soon proved to be true. This coalition has been fighting IS for the past two months but, say sources, the battle has reached a stalemate.